A rare hoodwinker sunfish was discovered in Goleta, much to the shock of scientists, Feb. 27, 2019. This species of sunfish, the first to be discovered in 125 years, was just recently found in New Zealand. The hoodwinker sunfish -- clearly an interesting looking swimmer -- can reach up to 10 feet in length and weigh up to 4,000 pounds. It wasn't clear how the fish, never seen before in the Northern Hemisphere, ended up in Southern California. A rare fish that looks more alien than aquatic washed up in Santa Barbara County, scientists said Wednesday. The mola tecta, or hoodwinker sunfish, has never been seen before in the Northern Hemisphere, let alone Southern California. It wasn't that long ago that the fish was discovered to exist at all. 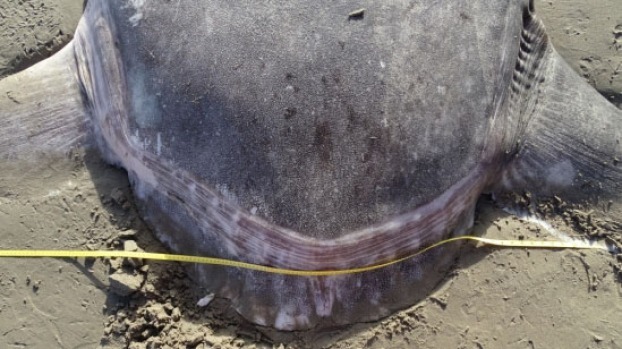 This species of sunfish, recently found on a New Zealand beach, was the first to be discovered in the last 125 years. 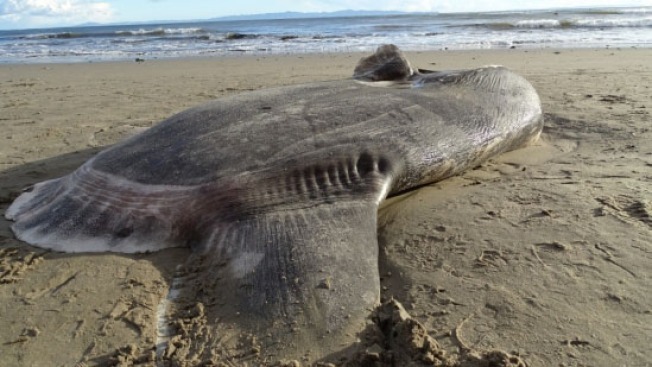 Rare hoodwinker sunfish washes ashore in Goleta, California, Feb. 26, 2019. The fish out of its normal waters washed up in Goleta, at UC Santa Barbara's Coal Oil Point Reserve. "This is certainly the most remarkable organism I have seen wash up on the beach in my four years at the reserve," said Jessica Nielsen, a conservation specialist at Coal Oil Point. An intern found the funny fish, which had already been dead, and told Nielsen. 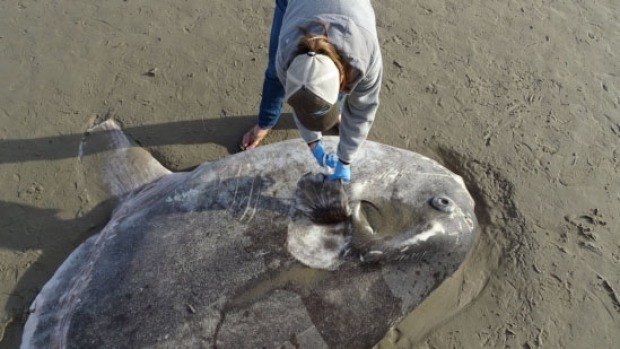 An associate professor from UC Santa Barbara came to the beach to inspect the sunfish, and after sharing photos on social media, scientists on the other side of the globe saw the specimen. Marianne Nyegaard of Murdoch University in Australia, who's the world's primary expert in the species, saw the post, and was hesitant to identify it. "I just couldn't be sure due to pixilation and kept thinking I was totally being hoodwinked by this stranded sunfish," she said. But the hoodwinker turned out to be just that. "I literally, nearly fell off my chair (which I was already sitting on the edge of! 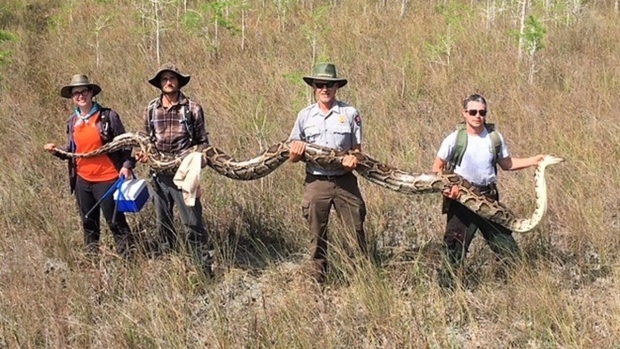 )," she said after examining more photos from UC Santa Barbara's naturalists, Nielsen and Tom Turner. It still wasn't clear why the sunfish was so far from home. Jimmy Fallon and Robert Irwin, 15-year-old son of Crocodile Hunter Steve Irwin, get into an accidentally public confrontation backstage that spills into an awkward animals segment that includes a lizard, an owl and a cat from Staten Island.